SeaGate, part of the Digital Ocean project, is a virtual ocean world based on the coral reef of Abu Galawa in the Red Sea. In Digital Ocean SeaGate player plays as one of the fish inhabiting the area and does small tasks. 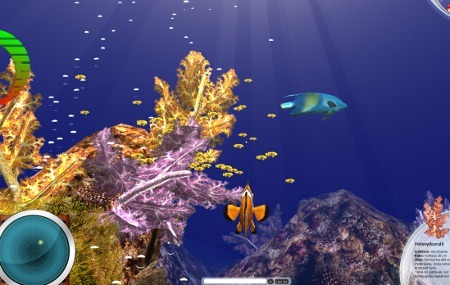 Completing these tasks allows the player to control other fish in the area. Player also gets information about the different species by clicking on them with right mouse button. 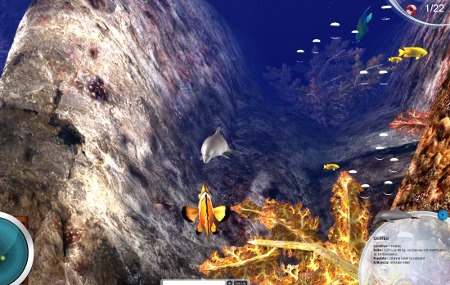 The game’s 3D virtual world is created using data collected from real-life diving sites. It performs as a link between different diving sites allowing users to experience them through gaming and easily correlate together. SeaGate helps users in acquiring a global vision of the subsea network that is being built by motivating them to go to other sites and explore them. Digital Ocean SeaGate aims to raise public aweraness of oceans and their situation by providing easy to access combination of knowledge and entertainment. The combination of simulation, scientific data, and game-like usability and motivation the game aims to provide engaging and convincing scenarios.